Woke up, a whole ten and one half hours after the day had begun. One lazy bit of a busy Sunday. The big picture is in my head but the bits keep falling under the mind-sofa (represents an obstruction here, not comfort.) Mr says we shall go to the woods to find some refreshment of purpose and to fell trees with our bare hands because we are quite Super. On the way home I think about the old path we found and how deep it is pushed into the ground. Once upon a time the king of the badgers reached the massive age of one thousand years and it was time for him to travel out of his woodland kingdom. 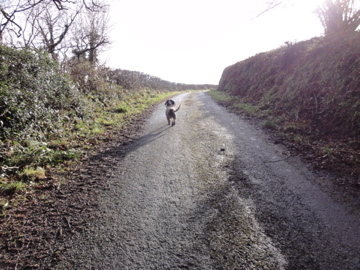 As he walked, his wiry buttocks dragged tracks, and these became our country roads. Because: an entirety of logical sense is not required to enrapture. Lily, I have been using a chainsaw. Can you respect me after what Mr. did? My wife escaped the destruction of Krypton to immigrate here. I had no idea there were other survivors. Delightful post!